Roadblock: The Very Best of Puzzle Apps 2013! We are proud that our app Roadblock by SmartGames is listed as one of The Very Best of Puzzle Apps of 2013 at GottaSolveIt, a blog that focuses on fun puzzle apps. As puzzle apps go, this is very well done and could make the list of Best Puzzle Apps of 2013. Because holiday time means play time we have put our Temple Trap App on sale. Get the app with all the challenges now at the App Store or Google Play! Sneak preview: update of Titanic app! A lot of people are enjoying our Titanic by SmartGames app on their mobile device or tablet. That's why we have been working hard to get an amazing update ready. We have created a lot of new challenges by adding an extra iceberg dimension to the game. The new challenges will feature icebergs blocking the boats, and you will need use the boats to move the icebergs and open up a path to rescue the passengers! Coming soon at SmartGamesLive.com: Tunga Bunga! Are you loaded for bear? A hungry bear is on his way to the home of the cavemen. Can you catch him before he hurts anybody? This time the special shape of the puzzle pieces makes it possible to position them in new, unexpected ways! 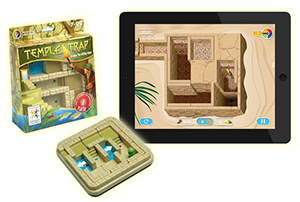 GottaSolveIt, a blog that focuses on fun puzzle apps has reviewed our latest app Temple Trap. Temple Trap is challenging and fun! The physical version is an ideal compact size. NEW: Now available in the App Store and Google Play: Temple Trap. Based on the award winning original puzzle game Temple Trap, we now present the app version with 110 brand new challenges! Guide your adventurer through this labyrinth in 4 different levels of difficulty. Yes, we are proud that SmartGamesLive was selected as a winner of the Academics' Choice Award™!